SKU: P233. Category: All Jewellery, Chakra, Chakra Pendants, Jewellery Stone Type, Pendants, Pendants Stone Type. This beautiful sterling silver Winter Sun Chakra Pendant is a representation of one of the oldest symbols – the spiral. It is a symbol of evolution, such as the cycle of the seasons, life, growth and change. In Celtic traditions, a single spiral represents the Sun. When the spiral is drawn clockwise, it represents the winter Sun. The spiral also symbolises expansion, cosmic energy and the vortex of the chakra energy centres, which control the distribution of energy in the body. As crystals resonate to a different energy frequency, so do chakras, each one of them having a corresponding crystal. 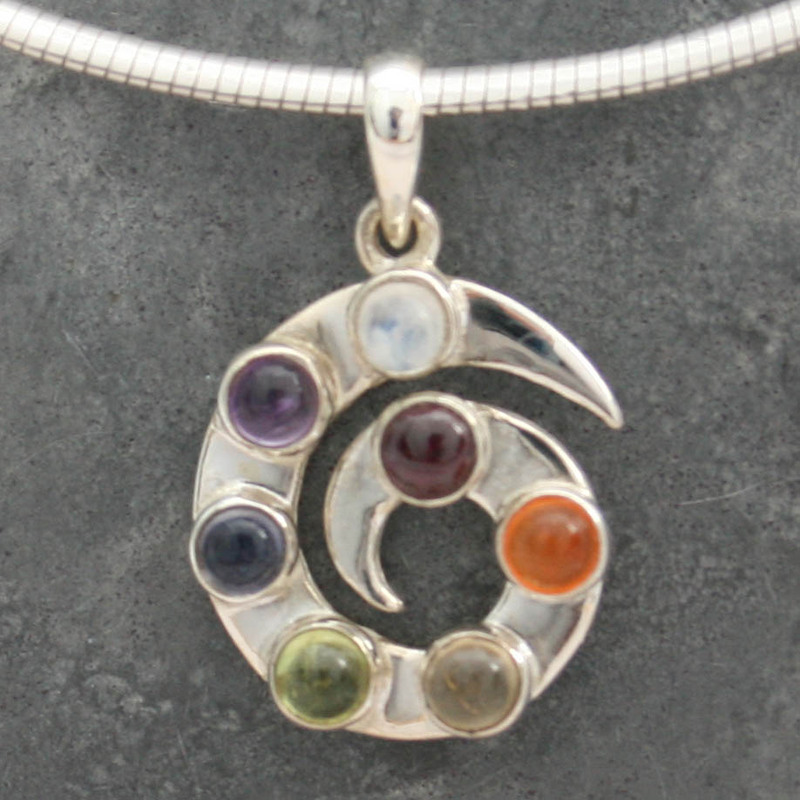 Wear this pendant to balance and harmonise your chakra system and boost your energy field. Chakra Spiral Pendant with Garnet , Carnelian , Citrine, Peridot, Iolite, Amethyst and Moonstone .